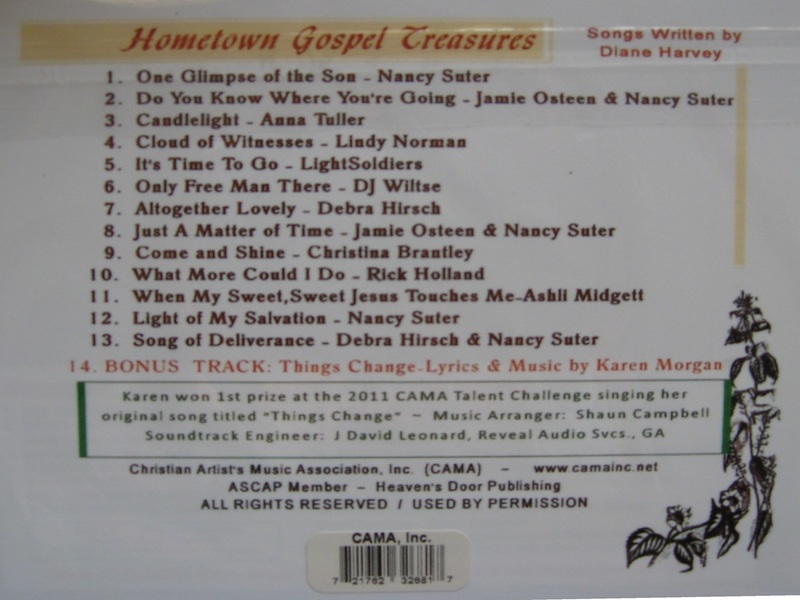 Album CD's Christian Aritst's Music Association, Inc. - Christian Artist's Music Assoc., Inc. CAMA Inc - Christian Music Album CD's - CAMA, Inc.
We will send your order out promptly within 1-2 weeks. Thank You for your support in helping us witness to others through music. We truly appreciate you for considering our music and may it be a blessing to you and yours!!! CAMA's Newest CD "Hometown Gospel Treasures"
$10.00 Suggested Donation GET YOURS TODAY! 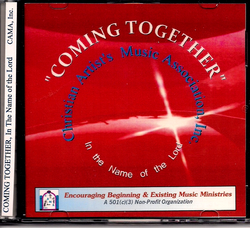 Coming Together, In the Name of the Lord was CAMA's first CD Release. The CD was released in February of 2009 when a Release Party was held at the First Church of God in Florahome, Florida, where we had a packed house with people standing in the narthex. What a celebration we had and what a blessed time for our singers and musicians. We are so blessed here at CAMA to know that we have so many talented individuals who are willing to face the crowds to sing for our Lord and Savior. What a Witness! 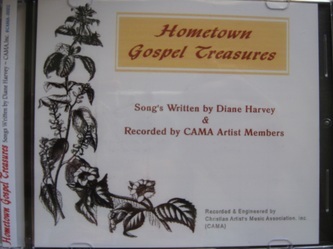 The title of the album and the song on Track 12 were specifically dedicated to the CAMA Artist Members. There are so many that work so hard to practice and compile songs to sing and play, but with all that Nancy Suter, the President and Founder of CAMA doesn't want them to loose their perspective with all the stage lights and their ability as a singer. She wrote a song to help them recognize their purpose, for doing what they do in singing for the Lord, and the Coming Together does just that. It tells them yes, we all come together in one accord but for the purpose of uplifiting the Lord in Praise, to use their music as a witnesing tool to bring souls to the Lord and to help uplift other Christians in their walk with Him, to have a fun time in the Lord, to celebrate our ultimate goal which is to see Him in Heaven soon. This is why we have to tell others through our music, so they can experience the same oneness with God that we have. We give much thanks to "Stair Top Studios" engineered by Tony Silcox and also to Ms. June Silcox for helping us bring together wonderful music for the sake of our Lord. Also, for Tony helping Nancy with the music and soundtrack for the Coming Together song. What a talent of arranging and singing the Lord has blessed Tony with. This CD is still available, ORDER TODAY! 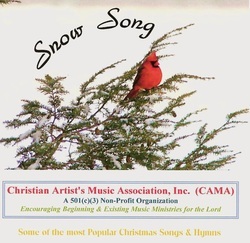 CAMA's "SNOW SONG" Double CD Album is still available for Gift Giving at Christmas time. There are 18 songs on this CD and was released last year and it is a great combination of the most popular songs of Christmas time and there are many favorites. Some of the songs include are Original pieces of music from some our our local songwriters and they are sure worth hearing, with beautiful lyrics that help us give praise to our Lord and King. What a special gift to give and also help one of the Non-profit organizations to further the gospel for Christ. Use it as a witnessing tool to someone that don't know Jesus, because there are also some of the secular songs that they may identify with. Give it to students and small children since there are a couple for the younger ones too. that other people have requested. We really appreciate the entire Silcox family for listening to those requests and we have no doubt that this NEW CD will be a big hit with others out there. 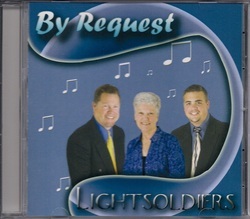 If you would like to order LightSoldiers recently released CD "By Request" please visit their web site at www.lightsoldiers.org. At the present time, you are not able to order them through our CAMA PayPal but if you need to order and don't have an email account you may call LightSoldiers at 904-282-0894. We know you will enjoy these popular songs. Nancy is the founder/president of CAMA. She has always had a love for music since she was 8 years old. From 8 to approx. age 21 she sang with her sisters "The Staub Sisters" in churches and for other venues. Her music focus changed when she and her husband Sim traveled to Florida. That is when she took notice that God wasn't done with her yet and led her on to minister in music. Nancy picked the songs on her CD because these songs were some that touched her heart the most. The variety of songs that were recorded are a mix of southern and country gospel, and Christian pop. It is a great variety in Christian music with talented songwriters that portray the signs of the cross, the crucifixtion and how special Jesus is and someday we will be in all eternity with Him. Nancy says, she knows that this CD will be a great witnessing tool because anyone that reads the title will just want to know, how we can live In His Presence all of our lives, and in that if we look to Him and believe in Him we will know and experience that peace and contentment that only our Lord can bring. We pray you enjoy the CD and it blesses you! THE ETERNITY CD WILL STILL BE AVAILABLE UNTIL THE INVENTORY RUNS OUT. This was actually the fourth album that Chad Anderson had written the lyrics and music to the songs. It is the 3rd professional recording with Albums titled "Just Around the Corner" and "An Amazing Mind" Chad is an exceptional songwriter and writes as if he is telling a story in his songs, from seeing the picture to actual feelings of the person(s) or thing(s) he is writing about. The "FEELS LIKE HOME" Album was recorded in Whitesburg, GA under the production of Mike Pillow of Lamp Music Group whom has recorded and produced albums for a variety of well-known southern gospel groups and country groups. One of the instrumentalists on the album had recorded music with Rascal Flatts. 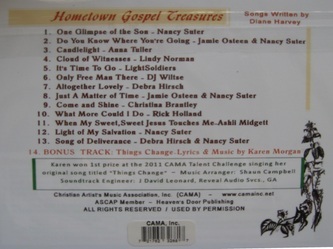 Nancy Suter, CAMA's President & Founder had the pleasure to perform some of the background vocals on the album before CAMA was birthed, which was her first appearance in a recording studio. Nancy's favorite song is "It's Not Too Late", because it is never too late to let Jesus come into your heart no matter what life you have lived. It was a truly wonderful experience and one that Nancy will never forget. Actually, Chad was the inspiration for CAMA and to help new artists (songwriters/singers/musicians) get started in their ministries. He truly was an important part of founding the non-profit organization.